Designed for use with the Keencut 144" Evolution-E2 Cutter, the EB360 Evolution 2 Bench is a dedicated base for creating a stable precision cutting table. The cutter is installed directly to the bench. An additional 155.0 x 47.25 x 0.75" worktop should be added and secured using the integrated brackets to complete the table setup. 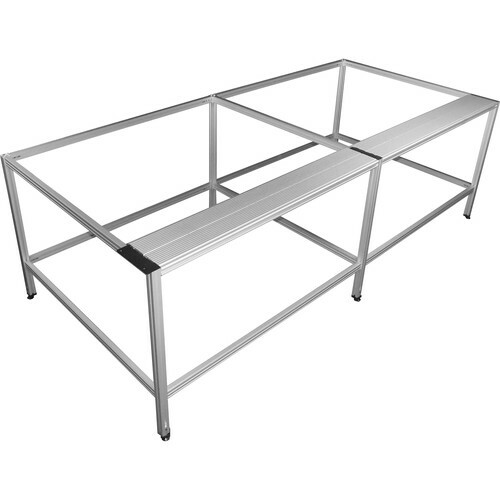 The bench is constructed from hard-wearing anodized aluminum alloy and features a unique joint locking system for stability and rigidity, even under heavy loads. Adjustable leveling feet are also included for installing the bench on uneven floors. Additionally, this bench's PROTEUS framework enables quick and easy setups, while the leg and beam extrusion design makes it compatible with optional extension kits for lengthening the bench size to create a larger overall workspace.